Anvil Foundations was established in 1994, by Nigel MacLean the Managing Director and continues to grow from strength to strength. The respect and reputation earned by the company for their provision of innovative, cost effective solutions has been well earned by its continuous commitment to excellence. 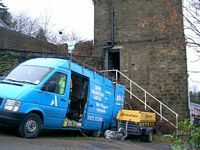 As an efficient and mobile operator Anvil Foundations is ideally situated to deliver a rapid and specific response to problem solving and unforseen foundation work. By its very nature foundation work can be the most difficult area to plan and budget - so everyone involved wants a quick answer and even quicker action! Effective, cost efficient, high quality delivery of underpinning, piling, grouting and minipiling contracts has developed the company into a major force in the specialist foundations industry, whether its new build or refurbishment, it's Anvil 'doing the business'. Anvil Foundations is leading the way in high-quality underground engineering with more projects booked than ever before and an envious conversion ratio from quote to project. Join the ranks of Anvil's satisfied corporate and private clients by asking for a quotation today to consolidate and improve your property. The structure and flexibility of Anvil Foundations means we can tailor our services for contracts of any size without compromising on safety or quality. Contact Anvil Foundations for full details or a Quotation for your next project.